Urban Legends is located in beautiful and historic Kingston, Ontario, Canada and owned by Mary Ann Nemisz. I am currently the VICE PRESIDENT / FOUNDING MEMBER of the THAI RIDGEBACK CLUB of CANADA, VICE PRESIDENT of the CANADIAN NATIONAL NEAPOLITAN MASTIFF CLUB, as well as the SECRETARY/ORGANIZER for the CANADIAN MOLOSSER ASSOCIATION. 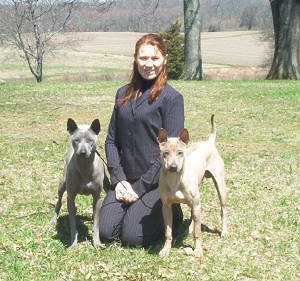 All of my Thai Ridgebacks are raised in my home, and NOT in a kennel setting. I maintain a small number of dogs so that they can receive the love and attention that they require. They are very important part of the family and are first and uppermost well-loved pets. My aim is to breed sensible, happy, healthy Thai Ridgebacks who are a pleasure to live with as pets and show dogs. I take pride in producing fun-loving puppies with tons of attitude and showmanship. I breed for quality, NOT for quantity. Therefore, in doing so, I only have a very limited number of puppies each year. Every litter born here at Urban Legends Kennels is raised in my kitchen and properly socialized before they go to their new homes. I warrantee all puppies for temperament and genetic problems. All puppies are health checked and have their first vaccinations before they leave for their new homes. I will only place puppies in homes with carefully screened people. I provide a written guarantee of health, and a pedigree, so you can be confident of a puppy's physical well being, and know where your puppy comes from. All of my puppies are provided with first shots at 8 weeks old, are de-wormed, receive a health check from my Veterinarian, are identified by microchip and are always fully registered. Each puppy goes to their new home with a puppy pack.